It’s hard to believe that 20 years ago, computers weren’t used much at work and the mouse had only recently been invented (1984). Today, using the mouse is a fundamental part of the workday. Unfortunately, intensive use of these or other secondary input devices can be a source of discomfort or pain. Hopefully, our advice will keep you from feeling the pain of the mouse trap. Do you have a love/hate relationship with your mouse? Do you have more quality contact time with your mouse than your spouse? Here are the fast facts on this workplace pest. Your mouse position and set-up dictates your shoulder and wrist posture. Your work habits can make the problem worse. Park your wrist in ‘neutral’ and relax your grip on the wheel. Inhale, exhale, repeat as necessary. The wedge or the putter? 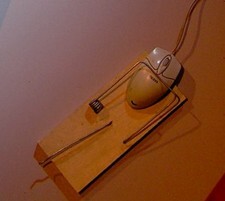 Standard mice fit most people’s hands and meet the demands of day to day computing. However, if you’re a high intensity computer user or have discomfort, alternative input devices can help you minimize the stress on your wrist and arm. Once you understand that repetition and awkward postures can lead to discomfort – what can you do to manage? Stretching and exercises can help to ease the tension in overworked muscles.